Alex was one of my brother’s friends who was in his wedding in August 2012. I had always heard my brother and sister-in-law talk about this Alex guy, but never had met him. They actually did not know if he was going to be able to make it to the wedding because he was in the Army as a sniper at that time. We met briefly, a year goes by, and I built up enough courage to send a message on Facebook to him in September 2013. Our love story could not begin until Alex had my brother’s permission to date me. We made many amazing memories over the next couple of years and were both trying to build in our careers. We both knew we were right for one another and wanted a future together, but never talked about exactly when it would happen. Alex invited my dad on a finishing trip October 2015 and I had no idea this would be the time Alex asked my dad if he could marry me. I had never shown or mentioned what kind of ring I wanted to Alex. He was a smart man and knew I loved Pinterest so asked some help from his cousin to see if I had “pinned” any rings. Alex then took the initiative to take my dad and his uncle to Jewelry Exchange. Alex told me after the fact that Kelly from Jewelry Exchange was very patient about explaining the different stones, values, class, etc. When Alex did not see the ring he wanted in the store Kelly without any hesitation took the next step and helped him customize the most perfect ring. Kelly answered the million questions he had and was always right there throughout the entire process. On March 5, 2016, Alex’s family and my family were meeting for the first time in Lynchburg, VA where my youngest brother plays lacrosse. I had planned the entire day not knowing I was planning my own engagement. My dad thanked everyone for coming and then Alex jumped in and said thank you, but with a little more by saying he wanted to grow the family. I was just shaking my head agreeing with what he was saying, but when I turned to my right, he was down on one knee. After two and a half years of dating, I became the luckiest girl in the world and I would say yes to the man of my dreams. He loves to surprise me and he definitely did that day by asking me to marry him and him designing the ring I had dreamed about without telling him anything about it. 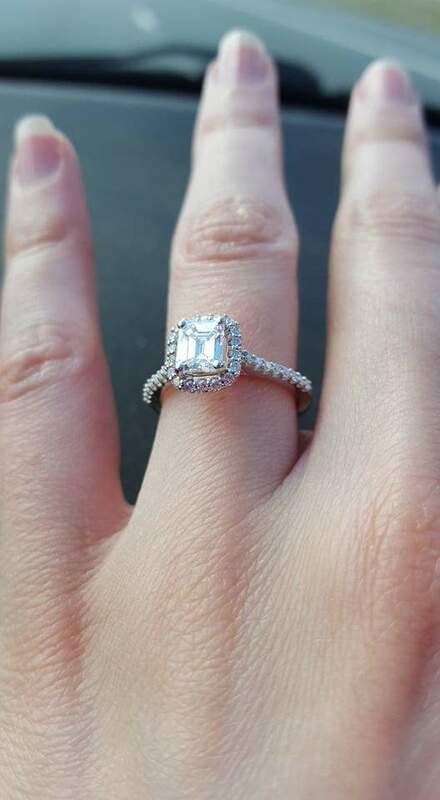 Wow, I could not believe I had planned my own engagement without even knowing! So glad we were surrounded by family that day to see the next step in our future together. One perfect day and the next one will be the day we get married!